Wil and Kin Shriner will be on the air at BocaChamberRadio.com (also a free app download) tomorrow at 11:30. The radio station is located within the Boca Chamber at 1800 N. Dixie Highway in Boca Raton. Who doesn’t remember Scotty Baldwin from General Hospital fame? Plus, his twin brother, Wil who has been on Carson, Leno and is a writer and director on some of the most popular sitcoms ever! 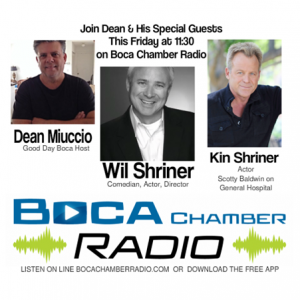 The Boca Chamber is the ONLY CHAMBER IN THE US to have its own 24/7 online radio station.